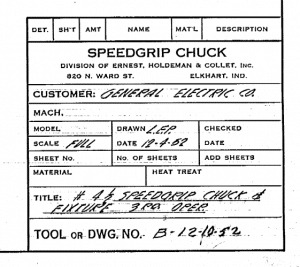 Welcome to Speedgrip Chuck Company’s blog! This our inaugural blog post. We see this blog as a way for us to share general company news that people outside of Speedgrip may be interested in, with an emphasis on showcasing some of the very interesting applications which come through our engineering department. My name is Dave Stokely. I am the chief designer for Speedgrip. I have been with the company since March 12th, 1979. 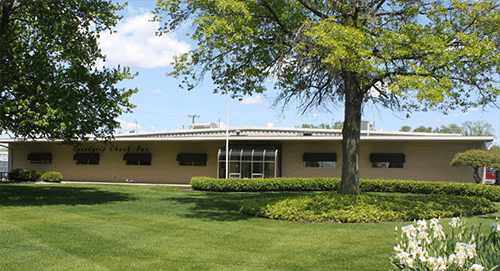 I began my career here working as a machinist, while at the same time going to college. Much of Speedgrip’s management team also began their Speedgrip careers as machinists, which gives us the huge advantage of having practical experience both in the challenges of manufacturing chucks and in having hands-on manufacturing experience in similar challenges to those that our customers face. 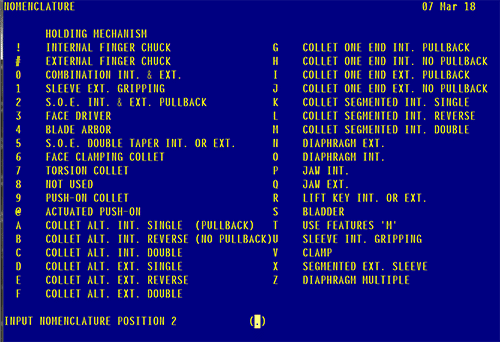 I thought it would be good to begin this blog by telling a bit about the history of Speedgrip. Shortly after the end of World War II three men, who had previously worked at Foster Machine Company, joined forces to put their design and manufacturing expertise together into building a new type of work holding device, a single taper, alternately slotted collet for holding inside diameters. This device offered several benefits of high accuracy, while also being very affordable. 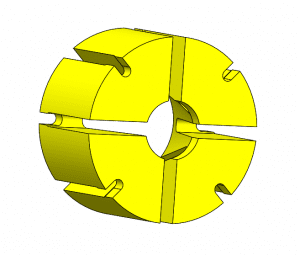 The single-taper collet became the bread and butter product of Speedgrip. Available in standard sizes from .500 up to 17.000 inches in diameter, this collet has been the internal gripping workhorse for many thousands of customers spanning virtually the entire spectrum of American Industry. From this humble start, Speedgrip has gained a well-deserved reputation for innovative solutions to some of the industry’s most vexing problems. Over the years we have ventured far beyond the internal alternately slotted collet design, to where today we have over 35 different families of proven workholding devices in our arsenal, to call upon for use in the daily challenge increasing industry’s productivity. We have categorized our designs in a computerized nomenclature system so that when a customer or sales representative calls, we can quickly locate a reference design that we have previously manufactured as a starting point for the discussion on a new application. I have been a designer at Speedgrip for well more than 30 years, and I am still excited by the fascinating design challenges that each new project offers. From my memory a few of the applications we have designed workholding devices for: Airline landing gear struts, missile bodies, hip implants, holding a camera to inspect radioactive waste, hoe handles, the paper feed rollers on a large printing press, dental implements, revolver cylinders, high pressure gas tank cylinders, gun barrels, 60” jet engine rings, automotive: gears, pistons, high performance racing engine blocks, differential cases, valve stems, crank shafts, supercharger turbines, holding outdated Vietnam era artillery shells while they were being cut apart by water jets, forging gears at red hot temperatures, balancing huge flywheels, turning railcar wheels. . . I don’t know where to quit. I’m sure as soon as I stop adding to this list I will think of several more fascinating applications that Speedgrip has designed workholding for. Our engineering department has well over 100 years of design experience. I do not think that it is an exaggeration to say that we see more varied manufacturing applications in a week than most process engineers would see in a very busy year. Our great depth of design experience can be a very valuable asset when a manufacturing engineer is beginning to process a new part. 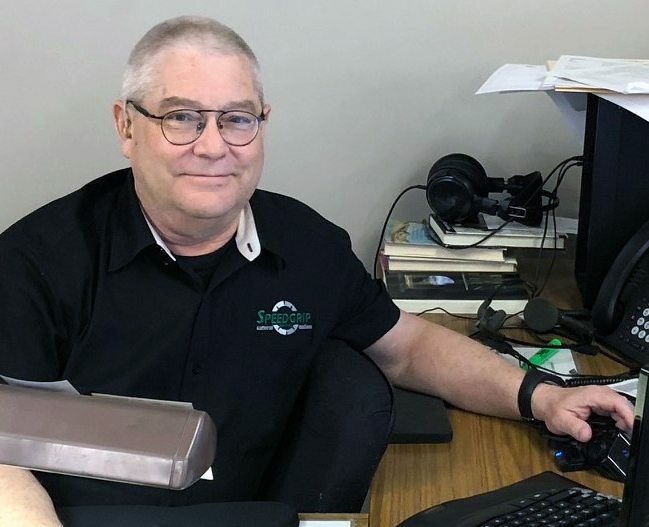 Call one of our outside sales representatives using the sales rep. locator on this website, for an in-plant visit, or call us directly at Speedgrip and we will help you solve your work holding challenges.